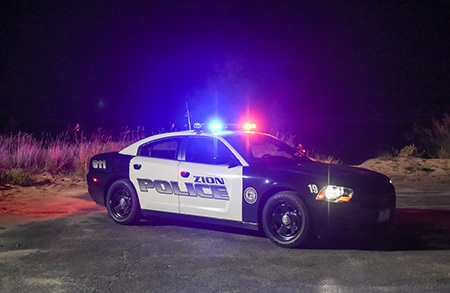 The mission of the Zion Police Department is to maintain peace and good order; protect life and property; prevent and investigate crime; and respond to community needs. To touch our community in a practical, effective, and collaborative way, designed to augment the purely reactive, incident driven model of the past. Together we can improve the quality of life, through community empowerment, partnership, and creative problem solving. The Zion Police Department is comprised of 47 sworn officers, 9 dispatchers, 5 full-time and several part-time civilian employees, all under the direction of Chief Stephen Dumyahn. The Police Department is divided into 2 divisions, Operations & Administration. The Operations Division consists of Patrol, Investigations and Community Services units. Patrol – Sworn officers assigned to Patrol respond to all calls for service, emergency and non-emergency, and are the most visible members of the department. Investigations – Sworn officers assigned to Investigations as Detectives are responsible for conducting in-depth investigations into criminal complaints ranging from financial crimes, drug crimes to crimes of violence. Community Services – Civilian employees, assigned as Community Service Officers (CSOs), provide a wide variety of services to the community and the department. Services such as traffic direction, motorist assistance, parking enforcement and animal complaints. The department also has a Police Canine Unit, Ofc. Jon Meyers and his K-9 partner, Deutsch. The Police Canine Unit was established in 2010 and has been fully funded by a private foundation since its inception. Ofc. Meyers and Deutsch are assigned to the Patrol Division. The Administration Division consists of the Emergency Dispatch (9-1-1) and the Records units. Emergency dispatchers are available 24/7 and receive emergency and non-emergency calls for service. Those calls are then dispatched to police or fire/rescue units. The Records Unit processes all reports and citations and provides walk-in service for the department.